Today I drew three things at the National Gallery of Australia. The cancellation proof of David Hockney’s Portrait of Rolf Nelson, 1968, lithograph with hand colouring. The cancellation proof has red eyes and bow lips with a peace sign on the sitters shirt. You can see the original version of the print here. People sitting in the Members lounge. A Gandaran Bodisattva, carved from grey schist. Earlier this year we went to a talk at the National Gallery of Australia by Philippine artist Rodel Tapaya. His work is an exuberant mix of the contemporary, political and the mythic. 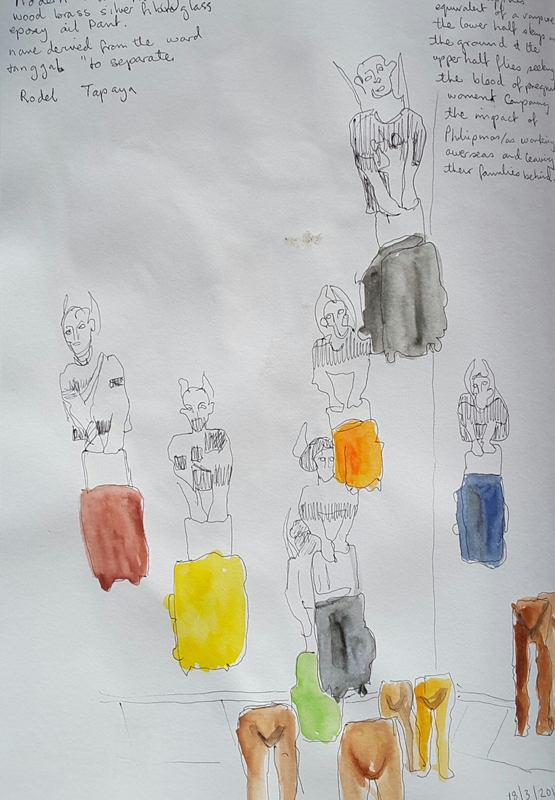 The sculptural work I sketched, above, of suspended figures holding suitcases comments on the impact on the children of parents forced to work overseas. He uses the image of the manananggal, the Philippines equivalent of the vampire. These creatures leave the lower half of their body behind, as they fly off nightly to drink the blood of pregnant women. The contention of this work is that Philippino parents earn an income by leaving their own children behind to work as carers for other people’s children. Last night my partner and I headed out to Dr Sketchy’s at the National Gallery of Australia. Like everyone at our table we were unsure whether there was a theme for the evening, until models in silver and gold paint appeared! Everything metallic and shiny was the story. I decided to use my Posca markers for some of the sketches, particularly as they already had the seal of approval for use at the event. I liked using them, but realised I should have done some testing before I went. My yellow ochre marker, used above, just wasn’t flowing very well, so I ended up with a rather scratchy effect. It was also a pleasure to see a male burlesque performer/model in the line-up. Sir Regal Shivers (and his dragon George) certainly got the audience shouting for more. We were also treated to performances from visiting interstate burlesque performers including the wild Zelia Rose, who was the 2014 Miss Burlesque Australia. The evening finished with the final group pose. I managed to only get two of the models into my sketch. As always it was a tremendous evening. The output of all the participating sketchers was amazing and the performances particularly good. I’m looking forward to next time! Some recent sketches using coloured pencil and my new toned tan Strathmore sketchbook. Today’s effort from the window of the National Gallery of Australia’ cafe window. This section of the garden has recently been cleaned out and re-planted with grass trees. I’m trying not to resort to ‘colouring in’, hence the vigorous strokes, which I’m enjoying making. One more from the archive, a sketch in my toned-grey book, a spool of twine at a building site. A spool of builders twine, coloured pencil on toned grey paper, 11 April 2016. Today was the annual Big Draw event held at the National Gallery of Australia. Several members of Urban Sketchers Canberra met up for the event and joined the crowds. Just inside the front door patrons were serenaded by the Ukelele Republic of Canberra band, singing and playing their way through a wide ranging repertoire. There were eight activities on offer and per usual it was impossible to get around them all in the three hour timeframe. First stop for me was Garden Country, in the Aboriginal and Torres Strait Islander Art section. Here the work of Gertie Huddlestone was used as a starting point for a group work on the floor, or for some of us some individual inspiration. I started to walk through to some other areas of the gallery, stopping to talk to the staff members overseeing other areas such as House and Garden, where some urban houses were being put together. I only managed to get to one other activity before the agreed meet-up time. At Is your face a mask, people were given an I-pad to sketch themselves over a ‘selfie’. This proved to be popular with everyone as you could get a print-out of your efforts at the end. Our group decided to get together for lunch over at the National Portrait Gallery where the crowds were not so busy. Here are our collective efforts from the morning.